Happy Veteran's Day and thank you all for your service, you are all appreciated and loved! 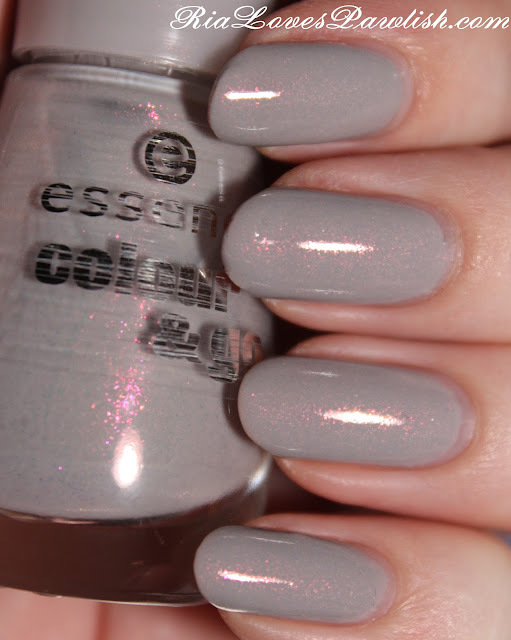 today's polish is Essence Grey-T To Be Here. i'd heard of this one... not sure from where, though! but, i've been looking for it ever since because the color sounded so dreamy. it's a dove greY creme with pink (yes, pink!!) shimmers. it is beautiful, but i am a bit let down that the shimmers aren't more in your face. (if you know of a polish that's like this but has in your face sparkle, comment below!) the formula is excellent, only two easy coats for full opacity. it doesn't dry particularly shiny, so it benefits from a shine topcoat to bring out those pink shimmers! two coats Grey-T To Be Here, one coat Seche Vite. i was concerned that such a light color with an inexpensive polish would be super sheer... but i was delighted to find it was quite opaque! the quality of these $.99 cent polishes is just bananas... i absolutely recommend them!